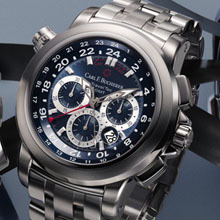 Four exclusive models from the Patravi line are now being produced by Carl F. Bucherer with a blue dial. These timepieces from the Lucerne-based watch manufacture not only offer extremely useful functions, but also fulfil the requirements of optimum visual distinctiveness and beauty. The infinite expanses of the sky, and the sky’s reflection in water, show the symbolism of the colour blue: blue embodies longing, the horizon, the desire for freedom and travel to far-off lands. Yet often what appears to be distant is closer than we think. Perhaps – in the most luxurious form imaginable – it could even be on your own wrist? their form, are now available with a blue dial and optionally with a blue calfskin or stainless steel wristlet. The various presentations of the new model demonstrate the boldness of the Lucerne watch manufacture in presenting practical functions like the chronograph, the big date, the power reserve and the retrograde hours display in an unusual but extremely elegant and aesthetically pleasing design. a rotation, this is transferred via a sophisticated gearing mechanism to an hours counter between 7 and 8 o’clock, where the corresponding hand moves downwards on a semicircular scale. When the hours counter hand reaches the end of the scale, it instantly jumps back to its starting position, from where it starts its journey again. This retrograde indication is what sets the Patravi ChronoGrade apart from conventional chronographs. Just as extraordinary as the retrograde display is the flyback function which makes it possible to restart the chronograph with one push of a button, without any intermediate stopping operation. Finally, the exemplary functionality of this exclusive timepiece is complemented by the display of the power reserve and the big date in two windows. The Patravi T-Graph differs from the Patravi ChronoGrade mainly in its visual aspect, through its unique barrel-shaped case. But there are also striking differences in the realisation of the individual complications. This is true of the power reserve, for example: with the Patravi T-Graph an arc-shaped scale with high/low display in the form of a disc is located at 6 o’clock, which turns in a clockwise direction when the watch is wound up. On this disc is a hand which also moves in a natural direction (clockwise) as the watch unwinds. The hand therefore does not behave in a retrograde fashion. 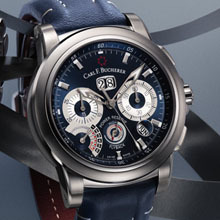 This technical refinement has been integrated for the first time by Carl F. Bucherer in a unique combination with a chronograph, a big date and a barrel-shaped case in the Patravi TGraph. Also worthy of mention at this point is the special arrangement of the chronograph function’s minutes circle. The timer scale has been positioned deliberately along the inner edge of the markers. This means that the stop-seconds can be read quickly and completely, accurate to a quarter of a second. The Patravi TravelTec is another chronograph with a strong character, which thanks to its sophisticated interplay of case and movement is able to display three time zones simultaneously. The date display of the watch can be switched both forwards and backwards. Switching is automatic when the time is reset. A red 24 hours hand ensures that the time at home is always maintained, wherever you may be. In connection with a fixed 24 hours scale on the dial’s flange, it is possible always to be completely sure what the time is at home. The red hand, interacting with a 24 hour rotating bezel inside the watch case, displays a third time zone, the rotating bezel being moved with the aid of an innovative single pushpiece at 10 o’clock, for which a patent application is pending. The desire to possess your own Patravi. In addition to these three extraordinary models, the Patravi ChronoDate is also available with a blue dial. Thus we have four utterly unique watches that, together, embody the philosophy that has guided Carl F. Bucherer’s watchmakers for 90 years. 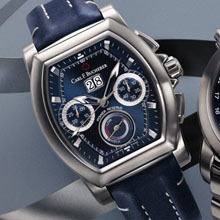 Four models which, with the colour blue providing the dominant visual feature, will arouse admiration and longing. But now this longing is not for something distant and inaccessible. It is simply the longing to own a Patravi “Blue Wave” for yourself. a brand of Bucherer Montres S.A.